Join the discussion on our forums! Come discuss Zealous Initiate over in our dedicated Zealous Initiate discussion topic. Deathrattle: Give a random friendly minion +1/+1. Ok, Initiate. You need to settle down and do your job. In this case, that means die so someone else can get a minor buff. Hard to tell if this is underpowered or not, honestly. Fun to play with in the right deck though. Underpowered as is. Pretty much a 1 mana 2/2 in a world without benefits to deathrattles like Rivendare. 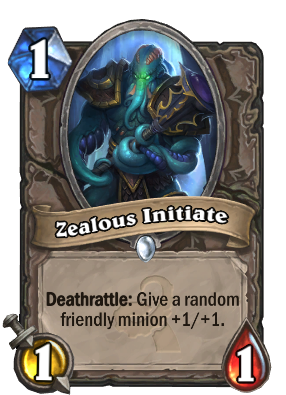 I'd be somewhat more impressed if it was 1 mana 2/1 Deathrattle give a friendly minion +1 health. I like this card. Seems a lot of people don't though. Zealous Initiate + Wisp/Target Dummy = Infinity +1/+1 value. Good point about the not wanting it to get killed alone. This card into totem gollem is insane!! Thats a 4/5 on turn two!!!!! Seems kind of cool. Definitely not something you want to pull with N'Zoth, though.